How have NATO and Soviet/Russian forces changed since the Cold War? What is the Russian conventional threat to NATO in the Baltic Sea region? In the years following the end of the Cold War, NATO's ground forces have substantially declined in size and shifted focus away from high-intensity conventional combat. 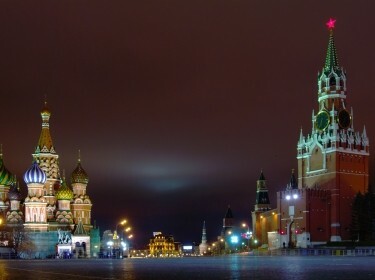 By contrast, while Russia also saw a major decline through the 1990s and 2000s, more-recent efforts have led to effective changes in Russian warfighting capabilities and a gradual spread of more-modern systems to much of the Russian armed forces. Recent improvements to readiness and to the ability to move forces quickly within Russia, combined with the density of anti-access/area denial capabilities arrayed to defend the Russian heartland, provide Moscow with a much greater ability to project force against countries on its borders. While NATO militaries have retooled to focus on stability operations and lighter forces that can be more easily deployed out of area to such places as Afghanistan, Russia has retained a combined-arms force that emphasizes mobility and firepower and trains to conduct larger-scale combined-arms operations. This gives Russian forces an important advantage in conflicts between mechanized forces close to their border. There has been a notable increase in the quality of Russian forces over the last decade: a growing number of volunteer soldiers, fielding of modernized weapons, improvements to readiness, and experience gained from large-scale exercises and combat operations in Ukraine and Syria. The highest density of Russia's most-capable ground and air forces is in its Western Military District, which borders the NATO allies in Estonia, Latvia, and Lithuania, which have very small conventional forces. Russia's demonstrated ability to mass ready forces from elsewhere within its borders, leveraging its internal rail and road networks, means it is likely to enjoy a significant time-distance advantage in generating combat forces during the opening period of a crisis. Funding for this study was provided by the Smith Richardson Foundation, philanthropic contributions from RAND supporters, and income from operations. The research described in this report was conducted by the RAND National Security Research Division. 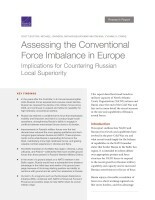 Boston, Scott, Michael Johnson, Nathan Beauchamp-Mustafaga, and Yvonne K. Crane, Assessing the Conventional Force Imbalance in Europe: Implications for Countering Russian Local Superiority. Santa Monica, CA: RAND Corporation, 2018. https://www.rand.org/pubs/research_reports/RR2402.html.